We’ve had our compost tumbler since August, and the kids are still excited about dumping in food scraps and leaves, smashing eggshells, and pushing the composter hard to get it turning: all good sensorimotor activities for children. They also like peering inside to see what’s changed and how warm it is, and seeing how the compost looks before and after tumbling. 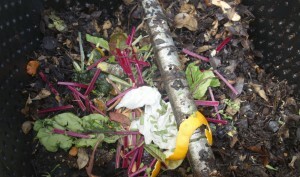 Composting holds the same joy for my children as cooking and free-form potion-making do. If their excitement about compost seems quirky, that’s partially because we’re culturally in the habit of downplaying and removing trash, of teaching that it’s icky and trying not to think too hard about it, under penalty of feeling guilty. 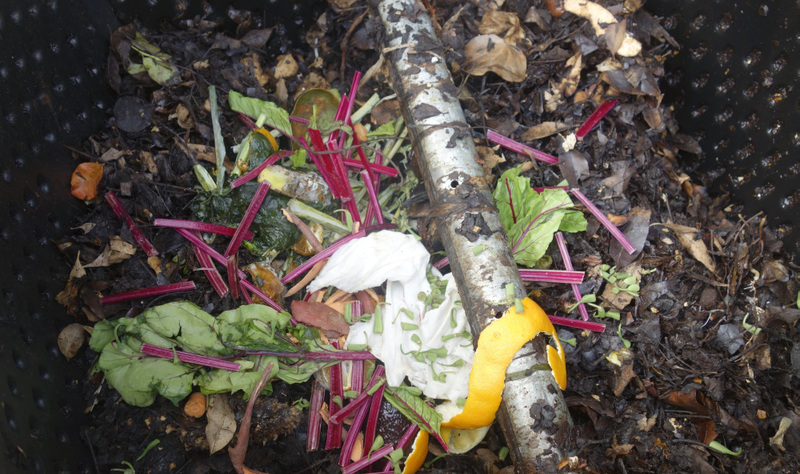 Composting our scraps doesn’t just change the scraps, though; it also changes what we think of them. Suddenly we’re witnessing something that has always been happening in secret, and we’ve become part of it. We’ve not only inserted ourselves as agents in the process, but parts of us literally are in the compost: bits of our hair and bits of our food, plus the occasional pee-soaked paper towel. It’s done more to create a sense of intimacy with the land than our short-lived full moon offerings or telling secrets to the trees, and so far the kids have enjoyed it more than gardening. Being mindful of where our kitchen scraps and moldy fruit go has proven surprisingly grounding for me. There’s something reassuring in seeing waste start to become something else, and something alarming in letting scraps disappear. Intellectually I know our trash doesn’t really disappear, so much as it’s dumped into a nearby canyon and slowly makes the canyon disappear, but we’re not allowed to visit the canyon and that makes the process nebulous. Really knowing that things don’t just vanish when you let go of them, and being able to approach the Crone’s work with fascination and reverence: that’s a gift, if I can give it to my children. At the edge of the world stands the Isle of Apples, where we may journey when we’re dead, and there stands an old, old woman stirring a cauldron. She’s so old that her skin is covered in wrinkles, but if you look in her eyes, you’ll see they’re bright and welcoming. If you look longer and don’t turn away, you’ll realize she’s a goddess, and her cauldron is full of sparks, like little stars in the night. Each spark is the spirit of someone dead or someone who hasn’t been born yet, and she stirs them, tumbling and tumbling and tumbling them, until they’re ready to be born and grow. And if you take a taste from her cauldron, it tastes sweet and fiery and earthy, all at once. Our composter stands in for the cauldron here, of course, with its contents tumbling and tumbling until they’re ready to help our plants grow. If we were using a bin instead of a tumbler, I might’ve emphasized how long the cooking took, or maybe we would’ve hit on a different metaphor for composting. It reminds me of digestion, for example, in the belly of the Goddess or a very slow-moving dragon. Another time I told my older daughter about part of a Greek festival called the Thesmophoria. According to Jennifer Reif’s reconstruction in The Mysteries of Demeter, offerings made to Persephone on her way to the underworld were kept underground, in a container that I see as comparable to our composter. They left Persephone’s offerings in the ground the whole time she was in the underworld. But then in the fall, around the start of the rainy season (which is when Persephone returns to Demeter in a Mediterranean climate), people dug up the offerings and saw how they’d been transformed–into blackened, decaying lumps, I imagine. They weren’t just offerings anymore, though. They’d been with Hades and Persephone in the underworld, and they’d transformed the offerings into gifts from the land of the dead. And there was something special about them: the gifts of the dead were just what’s needed to nurture new life. So the people mixed their black, gooey gifts with seed grain, to bless what they planted and grow plenty of it. I’m not presenting a thealogy here so much as I’m trying to change the lens that we use to see decay and trash. We’re letting them become a Mystery–at least incipiently– instead of just an inconvenience. Playful composting and storytelling help us shift our way of thinking about waste products, so that the compost bucket is more than a differently colored trash bin. And that hopefully will give us fertile ground for rethinking other practices. Of course, I know a lot of you have been composting for years, and here I am, going on like a teenager who’s just invented the kiss. So tell me, is there a special compost pile in your life?